evertontv is Everton FC's official online streaming service. 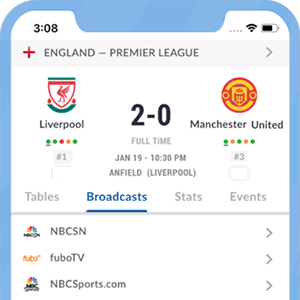 It allows subscribers to enjoy live audio commentary of first-team games; watch highlights of every first team games; get direct access to live interviews; watch games from the ladies' teams and more. *Got itLive Soccer TV does not provide evertontv live streaming. The information provided on this page is simply evertontv soccer TV schedule. Live audio commentary of Everton's Premier League matches. Live audio commentary of Everton's FA Cup games.